If you believe in God, do you know where He lives? God lives in the Garden of Eden. Then, what is the Garden of Eden look like? From the descriptions in the Bible, we know that the Garden of Eden is a garden full of rare flowers. The Garden of Rare Flowers occupies an area of 10 mu and it mainly transplants ornamental plants, such as Codariocalyx motorius(Houtt.) Ohashi,He Jiao(Chinese Name), Miracle Fruit, Brazil Bougainvillea, Cup-shaped Flower (Chinese Name), Sha Jin Rong (Chinese Name), Gout Stalk, Hill Tortoise (Chinese Name) , Artocarpus lacucha Buck.- Ham.ex D.Don, Japanese Melon (Chinese Name) etc. The flowers are in blossom all the year round, and all flowers contend in beauty and fascination. 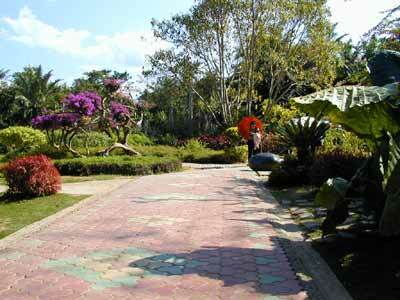 If you pay a visit to the garden, you could appreciate the colorful tropical scenes as much as you want.